Digital radiography can take x-rays of your teeth by using a computer. Not only do digital x-rays expose our clients and staff to 90% less radiation then typical film-type x-rays, they’re also a lot more sensitive when compared with classic dental x-rays. Digital x-rays allow for us to easily look at the whole tooth and root structure as well as surrounding bone and tissue. They provide us an opportunity to locate and diagnosis issues before they may be noticeable to the naked eye, and before they may cause substantial harm and discomfort. To get an x-ray, a little sensor pad that is attached by a line to a computer, is positioned in the mouth. A beam is then sent through your teeth to the sensor that saves the images. The doctors and team members may quickly pull up the digital x-rays on a monitor to examine the final results. No more waiting for x-rays to develop. 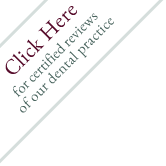 We are able to also share the images with you allowing you to see what we are explaining about your oral problem. After that we are able to save your x-rays on our computers and gain access to them faster than in the past. On top of that, the images can be delivered electronically to insurance carriers, dramatically lowering processing time and contributing to faster treatment.